1. As a nursing student at CSCC, am I guaranteed a spot in MCCN’s Online RN-BSN Completion Program? Mount Carmel College of Nursing guarantees admission into the Bachelor of Science in Nursing (BSN) Online RN-BSN Completion Program to graduates of Columbus State Community College’s Associate Degree in Nursing Program who hold an unrestricted RN license to practice nursing in Ohio and who have successfully completed 52 semester credits of general education and 32 semester credits of nursing coursework at the college level. 2. When do I need to contact MCCN? Columbus State nursing students are encouraged to connect with Mount Carmel (614-234-1176 or MyRN2BSN@mccn.edu) once admitted to the Columbus State Nursing Program. Mount Carmel encourages students to complete the admission application during the third semester of the nursing program (Autumn) of enrollment at CSCC. 3. 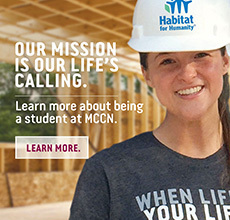 What is the pathway from CSCC to MCCN graduation? Upon completion of the Associate Degree in Nursing (73 semester hours) from CSCC and acceptance to MCCN, students will have the opportunity to take additional general education coursework (‘bridge courses’) at CSCC toward their BSN from MCCN. Bridge courses are taken during the summer following CSCC graduation. It is understood that most CSCC graduates will have additional general education semester credits to meet the MCCN admission requirement of 52 general education semester credits. CSCC graduates with less than 52 semester credits should consult with the Online RN-BSN Completion Program Admission Advisor. 4. What are the bridge courses? Students will decide how many of these four bridge courses to take at CSCC during the summer while waiting to sit for the NCLEX-RN. The corresponding course at MCCN for which there is automatic transfer is listed below. 5. How long will it take to complete my BSN? 6. Whom should I contact for more information?